Nurse Jackie, a 'dark comedy' set in a New York hospital, is both dark and funny - often at the same time - and should be a much bigger hit than it is (cue stamp with 'FACT' on it, stamping). Aww, telly programmes about nurses - because they always do such marvellous jobs don't they, nurses; and they work so hard for peanuts and are quite simply angels and so on and so forth. Or so received wisdom goes. But in the case of Nurse Jackie, received wisdom IS WRONG. In what is described on the BBC's website as a dark comedy, the New York-based Nurse Jackie, shown on the Showtime network in the US, and whose central character is a nurse called Jackie, is all the things you might not expect from a lead character who wears blue overalls and is qualified to administer pain relief to people who are bleeding. You see, even though she does do a marvellous job and probably does work hard for peanuts, Jackie is also selfish, an adulterer, and has a drug problem. But it's not that simple - the plot is as complex and involved as the most involved of soap operas, only a lot more involving. Deep breath: Jackie, a married mother of two young daughters, and played by Edie Falco who was in The Sopranos you know, is having an affair with her former colleague. But he also happens to be a bit psychopath, and is befriending Jackie's husband Kevin, after she tried to end the affair. Meanwhile, Jackie herself has a secret problem with painkillers, with an equally secret credit card on the go to pay for them. So that's where we are. And although it's complex, it's not complicated. But it's also brilliant - in turns funny, shocking, engaging and back to funny. And you might wonder why it's not a much bigger hit here in Britain, as it deserves to be. It's probably down to scheduling - it's on BBC Two late on Saturdays, and, as we approach the end of the 12 episode-long season two, we can breathe a sigh of relief that potentially inconvenient scheduling by BBC Two has ABSOLUTELY NO BEARING on the show's future. Because season three's just begun in the US. Yay! There's a season three trailer bobbin' about below if you dare. Tv-ooh's not watching it though as one doesn't like to be spoiled *dabs corners of mouth with a dainty napkin*. Nurse Jackie is very good. drug addiction with nurses is very common, in the healthcare environment. jackie still has a kindness towards her patients. As she showed when she gave a lupus patient drugs for free. i have lupus, but luckily for me i do not pay for my scripts. the programme is quite complex and dark at times. i have to watch it on my laptop, as it goes out too late at night for me. an earlier time would be good. About Nurse Jackie- This is a brilliant show. Every character in it has different sides and facets-like in life. The writing is perceptive and clever, its funny and tragic and O'Hara, Zoe, Gloria and Jackie and her family are so darned human and lovable. What performances! I so want Jackie to find a way to deal with her addiction and her overwhelming difficulties. Bring on another series! So pleased to see that a third series of Nurse Jackie has been made. We are going to get it in the UK aren't we ??????? Preferably at an earlier time slot ! aaarrghh I can't see the season 3 trailer! 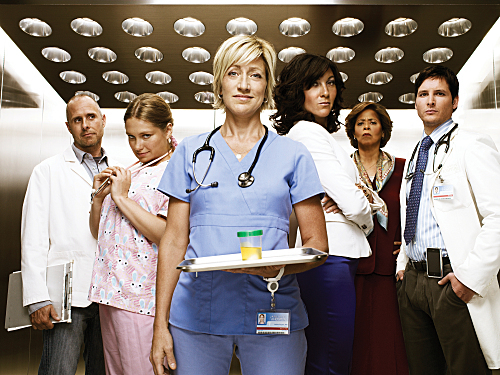 I love Nurse Jackie, it's so different to normal hospital shows. she's the female equivalent of House, another programme I really enjoy!! Please hurry up and show Nurse Jackie... but give us a good heads up, would hate to miss it!!! I've seen eps 1-6 of series 3 by nefarious means here in the UK and the show continues to entertain but not surprise. The complexity of JAckie's character and deceits is fun to watch, whilst lesser characters are beginning to bloom (Zoey and Gloria Akalitus). Coop is becoming a bit of a foil for the jokes and generally a bit of a wuss, making me wonder if we are being set up for a big surprise. The introduction of a new black nurse is being tweeted as tokenism to save ratings. Personally, with actors like Edie Falco and Eve Best, the shows ratings are safe for now. What a fantastic show this is, I'm rooted to my seat for every episode,it's just the best thing to come out since 'Frasier'. More power to your elbow guys! !